Looking for a new place to relax, gather with friends and enjoy a cold beer? 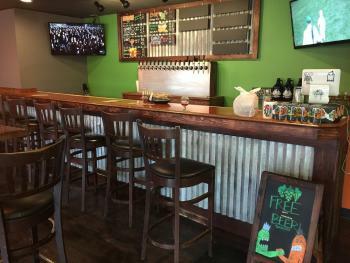 Look no further than Brew Link&apos;s Tap Room in Plainfield, which made some recent changes and is quickly becoming a local hot spot. 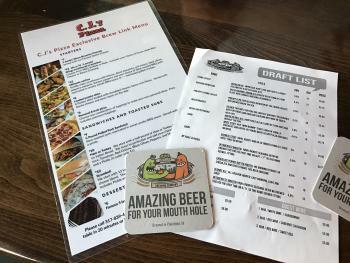 Brew Link Brewery has incorporated some noticeable improvements and additions to their Tap Room, 212 E. Main St., Plainfield, since I wrote about their opening last year. Thankfully, their brews haven&apos;t changed. 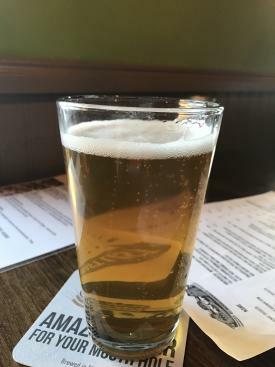 They&apos;re still serving up a stellar variety of crafts beer, but have improved how and when customers can come in and enjoy it. Here are a few of the updates to the Tap Room that will make this your new favorite watering hole. During my very first visit last year, a significant portion of the space was dedicated to their home brewing and wine fermenting supplies shop. To be honest, it was a bit intimidating to an amateur like myself. I was more interested in partaking in the fruit of their creative brewing labor. I must not have been the only one. They have opened up the space with extra tables, added lounge seating and a foosball table. All the awesomeness that I was drawn to when they opened, such as galvanized metals, rustic woods and colorful, clever signage, are still intact. The place looks amazing. We were there on a Saturday evening and spent a bit just taking stock of those around us. In one corner, at a low table, a small group was heavy in a game of cards. Beside us, a couple was catching up on paperwork while enjoying a few cold brews. Nearly every high-top table was full yet it never felt crowded. Several patrons were seated at the bar and were watching a game. I enjoy a hot spot, but I much prefer a hot spot where I can still have a conversation. That&apos;s exactly the atmosphere we found at Brew Link&apos;s Tap Room. Brew Link isn&apos;t in the food business, but they have an awesome arrangement with CJ&apos;s Pizza. In fact, CJ&apos;s has created an exclusive menu for Brew Link. You&apos;ll find a menu on every table and instructions for ordering. Place the order by phone and they&apos;ll deliver it to your table in 20 minutes. What? Perfection. You&apos;ll find all your favorite bar fare on the menu -- pizza, nachos, potato skins, wings and a variety of sandwiches. Items are priced $6-$12. The card players placed an order shortly after we sat down, and they had piping-hot stromboli and pizza at their table before we had decided on our first round of brews. Impressive. Originally, the business hours for Brew Link&apos;s Tap Room were similar to that of a small business with last call being around 6 p.m. The fine folks of Brew Link soon made some adjustments, and I&apos;m happy to see that the place is steady with patrons these days. Their new hours are Tuesday-Thursday from noon-8 p.m., Friday-Saturday from noon-10 p.m. and Sunday from noon-5 p.m.
Now, let&apos;s talk about those delicious brews. They&apos;re in the business of brewing great beer, and they&apos;re good at it. The only unpleasant part of our visit to Brew Link&apos;s Tap Room was deciding what to order. The husband and I are kind of opposites -- I prefer "traditional" beers, and he favors the more unique brews. We started with a Murphy&apos;s blonde ale and a Meisterburger pilsner. Both were crisp and delicious. We really wanted to try some of the more unique craft brews, so our waitress helped us decide on a flight that we would both enjoy. Our flight included How Now Brown Cow (a salted caramel brown ale), Pineapple Cosmic Jacuzzi (a pineapple IPA), Nutter Butter (a chocolate peanut butter porter) and their super popular Ivory (a white stout with vanilla, chocolate and coffee). So good, oh my. My favorite is the Ivory. It&apos;s a coffee lover&apos;s dream. I was impressed with Brew Link when I wrote about the Tap Room last year, but I&apos;m digging the additions and changes they&apos;ve made. Basically, we plan to become regulars. Next time we visit, we&apos;ll be sure to invite some friends, bring a deck of cards and come hungry. Stop in soon and see for yourself.